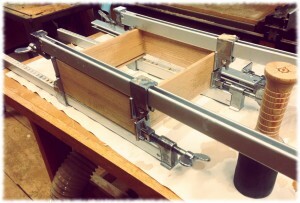 The drawer glue up. Finally. This is the third time; I hope good luck lies in odd numbers. After yesterday’s first attempt to make the drawer to complete the second nightstand I decided to take the night off. I needed to be more careful marking the dovetails out, and I figured that a break would make me less likely to mess up the joint a second time. Tonight I headed back into the workshop to tackle the drawer again. I shortened the offending drawer side and cut the tails from the existing pins. I even got the top side right. Not that it is the cleanest joint, but my dovetails are getting a little better. The next step was to cut the half-blind dovetails where the sides meet the drawer front. I cut the tails on both sides at the same time and chopped the waste out with a chisel. I then carefully marked the lines from the tails to the front panel so I could cut the pins. I even put an “X” in the spaces I should remove. However I got mixed up again (probably rushing a bit again) and put the “X” in the spaces that should have not been remove. Which required me to mill a new front for the drawer. Good thing I had some spare oak sitting around. So, as they say, the third time is the charm. I even more carefully marked the pins and cut away the waste. After a little chisel work, the sides and the front fit together. I then went to the tablesaw and cut a dado for the bottom to slide into. I applied a little glue to the joints, assembled the drawer and then clamped the piece for the night. Tomorrow night I should be able to cut and fit the bottom panel into the drawer. And hopefully this weekend I can sand and finish the second night stand and give it to Will. ← Can you see what I did wrong here?